I’ve decided to start a new column on this blog called Wine of the Week. 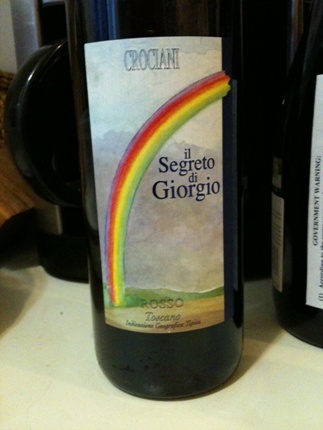 This week my favorite wine is Susanna Crociani’s Il Segreto di Giorgio 2007. I was supposed to be in Tuscany visiting Susanna this weekend but for a variety of reasons, things didn’t work out as I had planned. Saddened by that and other news, I reached for my first glass of wine in two weeks. This wine seemed appropriate both because Susanna, a dear friend, made it and because it is dedicated to her brother Giorgio who left this world too early in 2007 but whose life was marked by a gentle twinkle and fabulous sense of humor and proportion, both of which at times I confess, I lack. I’m turning over a new leaf as we move into the summer season and this wine seemed like a great way to start out. The wine itself, made from a variety of grapes which Susanna refuses to divulge, was delicious with red fruit aromas and flavors and soft sweet spice notes. The tannins were ripe and juicy. It went very well with the pork chop I made with tomato sauce, a Martha Gold staple growing up. So here’s to Giorgio and to the summer being everything we all want it to be. Auguri a te Susanna e a presto cara.